How Much Does a New Bathroom Cost in 2019? Most of us shop and make decisions by running our brains through an exercise where we weigh the perceived value of a product or service in one hand and the associated cost of that product or service in the other hand (and just like physical exercise, sometimes this is more taxing on us than at other times). “Shopping” for design and remodeling services can be challenging and so this question falls into the same level of difficulty as asking how much does a new car cost or how much does a new home cost. Here at DreamMaker, our most truthful answer is “it depends”. 1. Extent of the remodel. 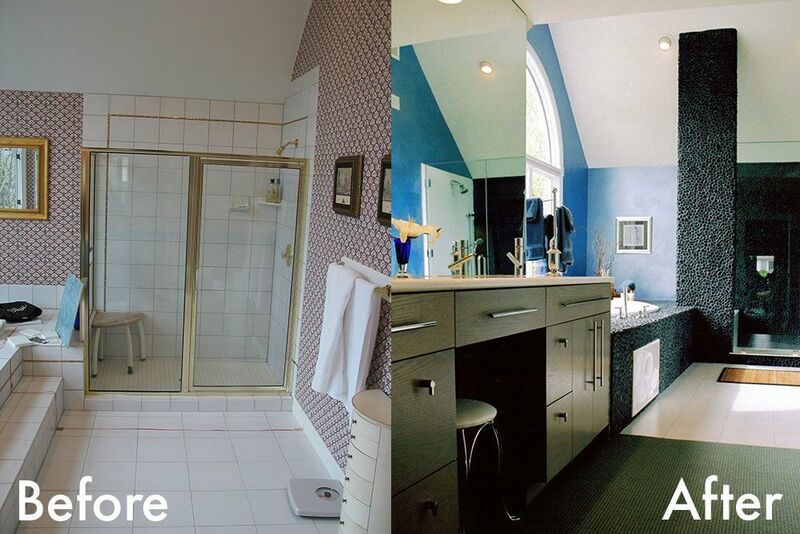 All bathrooms have similar mandatory pieces and depending on the size of the space, there may only be one layout that truly works (example, a 5’ x 8’ bathroom). But when space allows, and creativity is applied, rearranging can happen. Pull out of old fixtures and replace with new in the same configuration will cost less. Reconfiguring the location of fixtures, requiring alterations to electrical or plumbing for example will increase overall cost. Removal and/or relocation of walls will also increase the overall cost. 2. Level of materials used. There probably isn’t much of a need for explanation here, just know that as in all other industries, high quality materials that require more care and skill to produce, procure, or install will almost always come with a higher price tag. The other saying that will ring true, “you get what you pay for”. More standard materials, such as white porcelain sinks, tubs, etc. or chrome finish faucets often are less expensive. Ironically, many of these choices are popular right now with white subway tile, chrome and pedestal sinks. If you like this style or have a small sized bathroom these are the best options. Visit the showroom at DreamMaker Bath & Kitchen here in Springfield, IL, where we have a display much like this description and it is actually priced for some real hands on shopping. Unique and more luxurious materials often have an equally unique and special price tag. A good example would be travertine stone shower panels, specialty accent tile, stand alone tubs, high end faucets and unique lighting (all of these are also on display at DreamMaker). 3. Age of your home. With the charm and the character that comes with older homes, also comes an increased need for expertise when approaching any home remodel. Over time, plumbing has become more standardized, paint and other materials are more regulated for safety in homes, and building permits mean that more standard practices are used in construction. Older homes are notorious for surprises behind the walls. They can be fabulous homes, just be aware that they will cost more when remodeling. 4. Level of services provided by your contractor. There are multiple different ways to attack a home improvement project and many of these ways will ultimately achieve the same goal. What most people don’t consider however, is how to define cost. For some, cost is only the actual dollar amount paid. For the next person, time is an unlimited commodity so driving around town choosing materials, picking up samples, and communicating with multiple businesses is a reasonable part of updating their home. And then there are others who just love to find experts, communicate their desires and enjoy paying for the service of allowing someone else to take care of every little detail and allowing themselves to enjoy peace of mind that comes with this level of service. This is how these play out in the world of remodeling and “how much does it cost”. If you value a low price tag above all other things then the least expensive route is to design, select and procure all materials and find the professionals for each phase (or do-it-yourself) and then coordinate all pieces of production. It may save you dollars, but will absolutely cost you more time at both the planning and the production phase and probably cost you more stress and put you at an increased risk of things falling through the cracks or additional costs adding up. The middle road might look like choosing all products yourself and hiring a contractor to coordinate all phases of construction. Often the expertise of a designer is forfeited and still requires considerable time and effort in communications and coordination. If you value your time and your peace of mind, this is your best option. For a new bathroom completed with a full-service design/build contractor, the actual cash required will probably be a little higher than the other two options. For each DreamMaker project, a Designer assists with design of space and selection of materials all in the convenience of our showroom. One contract encompasses all phases and professionals needed. The entire renovation is overseen by a Lead Carpenter and Production Manager as part of the full DreamMaker Team. We call it the Simple Process and we are sure it will save you time, energy, headaches and worry. We stand behind our work and have for the past 20 years. Get to know the entire team! To look at displays of full bathroom remodels and to discuss realistic costs for the bathroom renovation you have in mind, we invite you to stop by the DreamMaker Bath & Kitchen Showroom to see more, learn more and enjoy the process of shopping.